Urbanization is reshaping the economy, energy systems, and climate of our planet. By 2050, the world’s cities are expected to add 2.5 billion people who will need housing, hospitals, schools, and places to work. Though global greenhouse gas emissions continue to grow, new practices in building energy efficiency and urban design can harness urbanization to address climate challenges while meeting these local needs. The WRI Ross Center for Sustainable Cities’ new Building Efficiency Initiative is part of a group that wants to make this happen. How do we link national and international goals on climate to the real urban challenges city leaders face today? Different levels of government have authority over different aspects of building efficiency. Energy efficiency standards for appliances, for example, are generally overseen at the national level, and many national governments also develop energy codes for buildings. Yet those codes may be subsequently adopted at the city or sub-national level, and enforcement generally occurs through local permits. Furthermore, city governments are responsible for procurement policies and decisions regarding public goods such as streetlights. This week in Lima, as nations gather to discuss a broader climate agreement for Paris in 2015, a large contingent of cities is also meeting to share their work and connect local action with the national and international processes defining priority actions, investments, and commitments. A new partner in this effort is the Energy Efficiency Accelerator Platform of the United Nations Sustainable Energy for All initiative (SE4All). One of SE4All’s goals is to double the global rate of energy efficiency improvement – producing goods and services in our economies using less electricity or gas. By focusing on “bending the curve” of energy consumption, this efficiency goal applies to all economies, whether developed or developing. Changing the amount of energy used to provide products or services over time means that the entire economy benefits because there is less wasted energy for the same amount of economic activity. WRI’s Building Efficiency Initiative is helping to lead a coalition of stakeholders and partners to provide cities with technical analysis and support to accelerate the adoption of efficient building technologies, policies, and practices. The Building Efficiency Accelerator is one of the SE4All Accelerators announced at the U.N. Climate Summit in September 2014. WRI will support this innovative public-private platform by working with city leaders as they create ambitious policies and building projects, and help them track their progress. Four cities and a number of businesses and NGOs are already supporting the Buildings Accelerator under SE4All – and more will be announced in Lima. Cities already on board include Milwaukee, United States; Mexico City, Mexico; Toyama, Japan; and Warsaw, Poland. These cities are currently developing their plans to accelerate action on energy efficiency. Milwaukee’s first step is to address one of the top global barriers facing building owners and cities seeking to improve energy efficiency: financing. Milwaukee has adopted a new financing mechanism called ‘property assessed clean energy finance’ (PACE). PACE allows building owners to receive low cost funding for efficient equipment and upgrades to their buildings and pay back the investment over time through an incremental charge on their property tax bill. This innovative approach is being tested in over two-dozen U.S. cities and helps building owners who would like to make upgrades but are unsure whether they will own the building over many years. It also helps overcome the challenges that landlords have if they make improvements but the energy savings are only benefiting the tenant: property taxes may be distributed to the tenants – who also enjoy the lower utility bills. Shifting investment to support accelerated energy efficiency provides economic benefits for the city in terms of better performing infrastructure, technology improvements, and lower water, energy use, and waste. But changing business-as-usual construction and technologies requires a collaborative approach. In addition to the four cities listed above, a number of private sector actors and NGOs are already supporting the Buildings Accelerator under SE4All. Private companies such as Philips, Danfoss, Alstom, Johnson Controls and others are joining forces with NGOs such as the United Nations Foundation, the U.S. Green Building Council (USGBC), ICLEI – Local Governments for Sustainability, and WRI. These cities and organizations are joined by financial institutions such as the Inter-American Development Bank (IDB) and the World Bank, which are already providing financial support to accelerate the lighting and appliances upgrades. Even more partners will be announced this week in Lima. Whether through building code enforcement, local financing, renovation targets, green schools programs, or utility incentives, cities have a number of project and policy pathways to act on building efficiency. 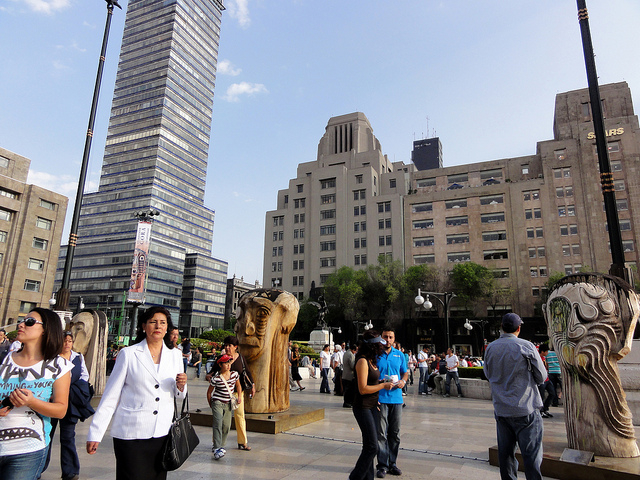 With strong leadership and a network of public and private partners, national climate negotiators at COP20 should feel good about taking bold action: building efficiency improvements provide a low-cost, low-carbon urban development pathway. The International Energy Agency (IEA) estimates that $1 spent on energy efficiency in electrical equipment, appliances, and buildings, avoids more than $2 in energy supply investments. These real economic benefits can be reinvested in the low-carbon and climate resilience investments needed in water infrastructure, waste management, and sustainable urban transit sectors, as well as in more sustainable buildings.